BULAWAYO, Jul 28 2011 (IPS) - It is becoming increasingly difficult for second-hand clothes traders like Susanne Jabavu to do business because of rising costs to import bales of clothing from neighbouring countries. As government attempts to revive the country’s failing textile industry amid pressure from clothing unions to curb the importation of cheap and second-hand clothes, the numerous women who make their living from this trade are finding business difficult. A year after the prohibitive duty tariffs were introduced, Jabavu is finding it hard to make a profit from her business after paying the duties. Import and customs tariffs have become a huge stumbling block for Jabavu, whose income solely comes from selling second-hand clothes and other cheap merchandise sourced in neighbouring countries. It costs her around 20 dollars per kg to import second-hand clothing, and a bale can weigh anything up to 60 kgs. Previously, Jabavu says she paid about a quarter of what she has to pay now and at any given time she imports up to five bales worth anything between 1,000 and 1,500 dollars. Jabavu is one of many Zimbabwean women who have set up stalls in flea markets across the city where they sell cheap, second-hand clothing and Chinese imports preferred by the country’s low-income earners. But this sector is facing an uncertain future as Zimbabwe’s economic reconstruction efforts continue at a snail’s pace. “The money demanded at the border for us to bring the bales (of clothing) is just too much and it does not make sense to make these long trips to Zambia and Mozambique when you won’t be able to pay the duty,” Jabavu says. Jabavu has an option of travelling very cheaply by train but she says this means spending long periods travelling, which is bad for business, so she opts for going by road. “If I am lucky, I can get a lift with those truckers who demand 100 dollars if am travelling from Mozambique. But other private transporters demand more,” Jabavu says. “We have tried (among the traders) to pool resources to assist each other with paying (the import and customs tariffs) but this has proved difficult because not all of us always have the money,” she says. The prohibitive duty tariffs introduced in 2010 are seen by many in Zimbabwe as part of government”s effort to promote local manufacturing as the country’s focus on economic recovery is increasingly being directed at the local textile industry, a one-time major employer. Finance Minister Tendai Biti has made the resuscitation of the country’s textile industry one of his top priorities. Both government and textile industry officials say the sector faces total collapse as major firms in Bulawayo have shut down. The “unsustainable and unfair” competition presented by second-hand clothes and Chinese imports are among the major causes for this. According to the ministry of industry and commerce, more than 100 companies have closed in Bulawayo in 2011 as the Zimbabwean economy continues to implode. This includes many textile industries and even previous major employers, Cotton Printers and Security Mills. “Some traders I know have decided to smuggle in bales of clothing because they cannot afford the duty,” says Janet Sibamba, another second-hand clothes trader. “But a lot of these bales have been confiscated by the customs people so it is making our efforts to work very difficult,” she says, adding she still has to contend with high transport costs of up to 200 dollars to haul her bales from surrounding countries into Zimbabwe. Traders like Sibamba buy second-hand clothing and cheap Chinese goods from Zambia, Mozambique and the Democratic Republic of Congo. However, it has become common for the Zimbabwe Revenue Authority (ZIMRA) – the country’s customs duty collector – to auction confiscated bales of second-hand clothing at border towns. 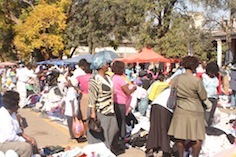 ZIMRA raids flea markets demanding proof that the second-hand clothes and other goods on sale were brought into the country legally. Customs officials who spoke to IPS said their warehouses are stacked with second-hand clothes after importers failed to pay duty on the items. “We know this is one of the means of earning a living for many women, but because these are for resale in the country, they must pay the required tariffs,” said one official. While the ministries of women and gender affairs and the Small to Medium Enterprises push for the economic empowerment of women, the high import tariffs has made this difficult. “There are obviously serious implications for women who cannot continue to earn a decent living because of these tariffs. And for us as country that already has a very low employment rate, it is difficult to imagine how women are going to (be) integrated into the mainstream economy,” says economist Johnson Samuriwo. The Zimbabwe Congress of Trade Unions says the country’s unemployment figures are hovering around 90 percent. “Government must not make knee-jerk responses to issues but must create platforms where all sectors of the economy (can operate) without compromising (each) other. I believe it is about uplifting people’s lives and if women feel they are not getting any support, that could have implications on how people vote, for example,” Samuriwo says. The National Union of the Clothing Industry (NUCI) – which ironically claims women as the bulk of the textile workforce – has been lobbying government to curb the importation of cheap Chinese and second-hand clothes, citing massive redundancies in the sector. “Our people (in the clothing industry) are suffering immensely because of these second-hand clothes as everyone is now buying a shirt for one dollar, meaning that what we are manufacturing will never be bought,” says Simbarashe Mutambanengwe of NUCI. A shirt in formal retail outlets can cost anything from 30 to 50 dollars. “It has simply meant employers cannot continue (employing) our members and government just has to act on this. We need to survive,” he says. For women like Jabavu who have never known formal employment, it could mean pursuing other avenues to earn a living.